In Berlin, however, a wall not only divides two cities – it separates worlds. Nowhere on the planet are the two superpowers closer, their differences more visible. Beneath the surface, however, it is the similarities which are equally striking. Cue the Mission Impossible Theme. Checkpoint Charlie was one of the few checkpoints between West and East Berlin, heavily guarded and watched. It was also the central checkpoint through which Spies passed from one sector to the other. Your mission, should you choose to accept it, is to sniff around for the Chief of Spies trying to make it through Checkpoint Charlie undetected. And you can take the sniffing quite literally, as each player assumes the role of a dog, representing the K-9 division (a nice pun on canine it took some of us German speakers WAY too long to recognize. Kudos!). The Spies are cats, of course, making a sneaky attempt on passing to the other side. While all cats may be grey in the dark, all these cats look different – well, sort of. The cats differ (or match) in five distinctive features, giving you 32 suspects. Each feline passes one of the five K-9 investigators for inspection. 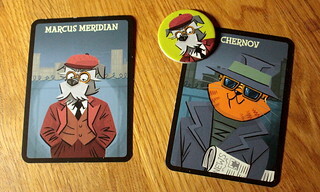 Unfortunately, each investigator is only given one clue at the start of the game, but since each dog is out to find the Chief of Spies themselves, they are not extremely willing to share information. You can, however, gather clues from the result of the other K-9s’ investigation. Is that passerby a cool cat in their book – or is he giving them paws? (This pun hurt my head. -The Editor) Make sure that it’s your curiosity that kills the cat. Each player chooses a K-9 officer, taking that role’s card and cardboard investigation marker. 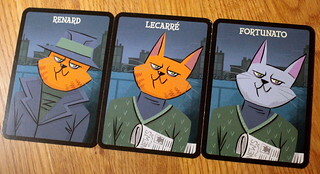 The 32 feline suspect cards are mixed and a stack created in the middle of the table. Now, each player draws a hidden clue marker, each of them indicating the features above, one side for each feature. The player chooses one of the sides, and puts the marker with that side up beneath their character card so no one sees it (e.g. the player draws the glasses / no glasses token, and chooses ‘sunglasses’, putting the marker with that side up beneath their character card). Thus, all five features are now determined and the cat matching all five criteria is the Chief of Spies. But each investigator has only one of the five clues – and the queues are forming at the checkpoint. So, the investigators go to work. What does this investigator know? In clockwise order, one player reveals the top card of the stack. If the cat seeking to pass matches the secret clue of the investigator, this cat is a suspect and held for further questioning. The player places the card in front of him. In subsequent rounds, additional cards are placed so all suspects are completely visible. If the card does not match the secret clue, the cat is free to go, meaning the player puts the card on their private discard pile. Only the top card of this pile is visible. Given there are only 32 cards, a round cannot take more than a few minutes before all cards are drawn – although most games don’t even make it there. The round also ends immediately once all but one player have made an arrest. How does that work? Easy! Whenever an investigator feels they have identified the Chief of Spies, that player will announce a suspicion, even out of turn. That player then puts the dog investigator marker on the card of their prime suspect, making an arrest. The player continues taking turns until the round ends, but cannot make another arrest or change their mind. If multiple players want to announce a suspicion and make an arrest (which can be the case when a card removed the final uncertainty among two options), they may do so in the order they declared themselves. Sequence is important as each cat card can only be suspected by one investigator. Now, once all but one investigators have made an arrest, the round ends, all clues are revealed, confirming (or disproving) suspicions and identities. The player who caught the Chief of Spies gets to draw a face-down yellow scoring marker, which score between 3 and 5 points each, keeping the exact score hidden from the others. Investigators who can pride themselves on having apprehended an assistant each get a white star token (1 or 2 points), while all players picking wrongly as well as the player who didn’t make an arrest get a black star (of 0 to -1 points). The game continues until a player has bagged 10+ points, or five rounds have been played. 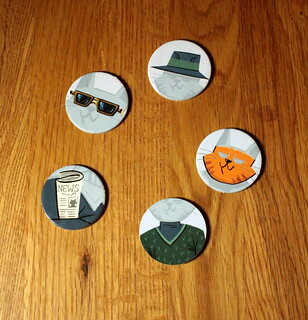 There are two built-in options, the Café Adler (which allows players getting an Adler scoring token to swap with another player for a token of the same color) – and the Stasi marker and card. 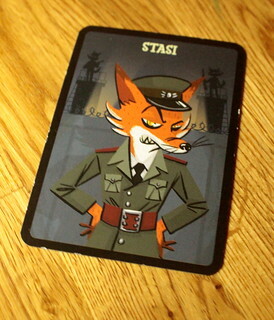 Being a black scoring token, if you draw it you are assigned the Stasi Officer card, meaning that in the next round, your clue token is public knowledge from the start, depriving you off your privileged knowledge. Playing with three or four players also works with public information, but not from the start of the game. 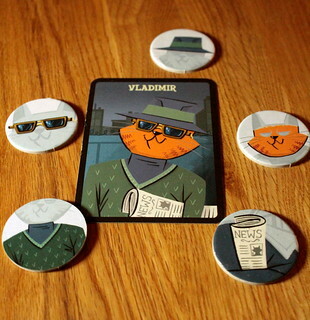 In this case, the remaining character card(s) are shuffled into the stack with the suspect cards, the remaining clue tokens are left in the bag. When a character card is revealed during the course of the game, the current player draws a clue token from the bag and then flips it like a coin. Whatever lands face up is the feature of the Chief of Spies, and now public knowledge. The later the final card comes and the clue is revealed, the more likely it is that investigators will take the missing piece of the puzzle as their cue to make arrests. Espionage theme and deduction games go together very well – for obvious reasons. And while Checkpoint Charlie fits the bill as such, it has no ambitions to get mixed up with the heavier deduction games like Sid Sackson’s Sleuth or The Resistance. The deduction factor is certainly there, but lighter, and the theme is really only on the surface. The immersion into the whole spy theme is therefore negligible, but the fun in playing certainly isn’t. Explained / learned within 5 minutes and usually played in less than 30, it presents a nice filler game which is neither entirely random nor requires huge levels of concentration. The scoring mechanism adds a bit of unnecessary randomness for our taste – then again having secret points certainly meshes with a Spy-themed game! This is only reinforced by the Cafè Adler option, which does not add too much except frustration – the Stasi Officer on the other hand is definitely a worthwhile addition, adding a big helping of unhappiness for the player whose privacy is infringed upon. The ideal number of players is certainly five, when all clues are assigned from the start of the game – but the mechanism to compensate for smaller crowds is devised well and makes sense. Also, groups who want to avoid public information being available too early or too soon have the option of setting aside cards before mixing in the character cards at their discretion. In truth, Checkpoint Charlie features little of the anxiety of the real espionage history of Berlin in that era – and given the target audience, that is a very good thing! Checkpoint Charlie is suitable for nosy investigators aged 10 and up because of the deduction factor, and it works great as a fun, family-friendly game featuring cool cats and lovely drawings of K-9 dogs.